NOVEMBER 2018 • FOODSERVICE EQUIPMENT & SUPPLIES • 55 Bull Stockwell Allen. "Snow ac- cumulation must be factored into the design, which features slow sloping roofs. This way snow stays on the roof all winter and won't slide off and pile onto walkways and doors." The interior design features wood and glass elements, which contribute warmth and natural light. 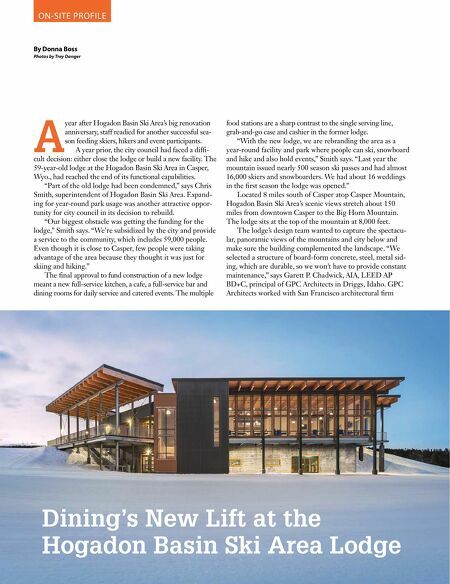 "We wanted the interior to also be low maintenance and durable so the building could be used for a variety of functions from skiers walking in their heavy boots to weddings." For instance, the dining room features •ocked, anti-microbial •ooring that looks like carpet but acts more like sheet vinyl. Classic Production Principles When designing the foodservice, the design team followed classic production principles to make sure food would •ow seamlessly from delivery to staging to preparation to service. 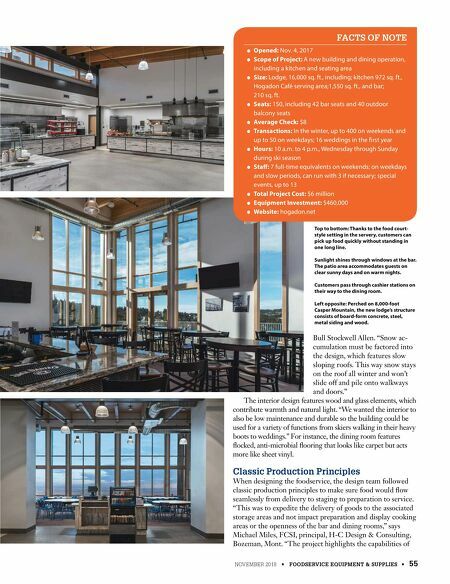 "This was to expedite the delivery of goods to the associated storage areas and not impact preparation and display cooking areas or the openness of the bar and dining rooms," says Michael Miles, FCSI, principal, H-C Design & Consulting, Bozeman, Mont. "The project highlights the capabilities of O Opened: Nov. 4, 2017 O Scope of Project: A new building and dining operation, including a kitchen and seating area O Size: Lodge, 16,000 sq. ft., including; kitchen 972 sq. ft., Hogadon Café serving area;1,550 sq. ft., and bar; 210 sq. ft. O Seats: 150, including 42 bar seats and 40 outdoor balcony seats O Average Check: $8 O Transactions: In the winter, up to 400 on weekends and up to 50 on weekdays; 16 weddings in the …rst year O Hours: 10 a.m. to 4 p.m., Wednesday through Sunday during ski season O Sta: 7 full-time equivalents on weekends; on weekdays and slow periods, can run with 3 if necessary; special events, up to 13 O Total Project Cost: $6 million O Equipment Investment: $460,000 O Website: hogadon.net FACTS OF NOTE Top to bottom: Thanks to the food court- style setting in the servery, customers can pick up food quickly without standing in one long line. Sunlight shines through windows at the bar. The patio area accommodates guests on clear sunny days and on warm nights. Customers pass through cashier stations on their way to the dining room. Left opposite: Perched on 8,000-foot Casper Mountain, the new lodge's structure consists of board-form concrete, steel, metal siding and wood.